Having worked on teams with some great strategists, I’ve experienced first hand the challenges faced and opportunities created by strategists. I’m all in on anything that can help make the role more efficient and more accurate. 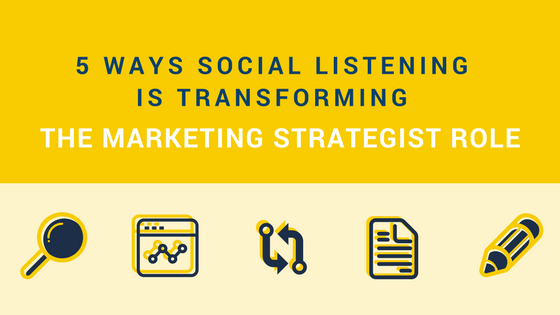 One of the many technological breakthroughs that is transforming the marketing process is social listening. Listening is the act of actively analyzing, researching and discovering insights from online conversations from people and using that intel to guide your marketing and advertising efforts. The best digital marketing strategies involve those that know and understand their audiences, customers, and people who engage with their brand. That’s the basic principle behind social media listening and the machine learning capabilities that brings a human element back into marketing technology. Marketing strategists now rely heavily on audience segmentation and customer research. Personas are key elements for any advertising or marketing team and more accurate persona profiles will help strategists position their brands or clients for more effective brand messaging. 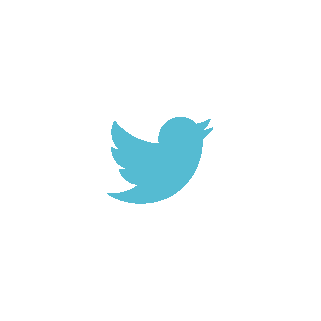 Social listening provides some of the most innovative and accurate outlets for such consumer research. 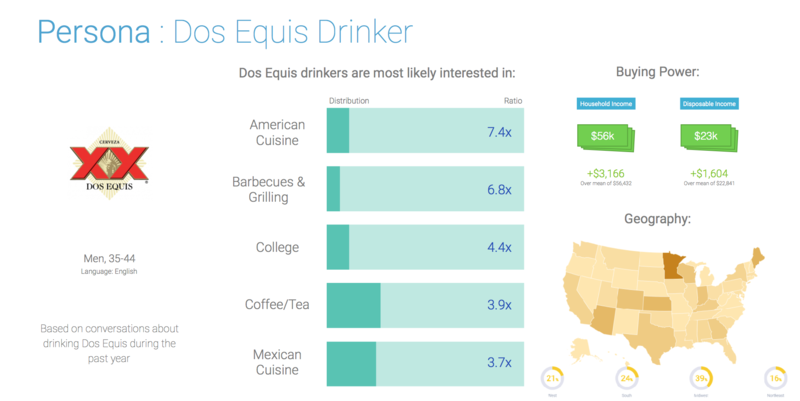 Find important insights for your consumer and audience research around a certain topic, brand, or industry such as sentiment, interests, trends, demographics, geography, influencers, etc. For example, Netflix can take a look at feelings and details about people who are interested or watching their new series, Ozark. By implementing this consumer research into personas and buyer profiles, strategists have the ability to build much stronger, more precise understanding of their customers and audiences. You’re probably well aware that developing strategies for marketing requires a great deal of data. But up until recently, the information we had access to didn’t go far enough in a crucial area: understanding audiences and predicting their behavior. 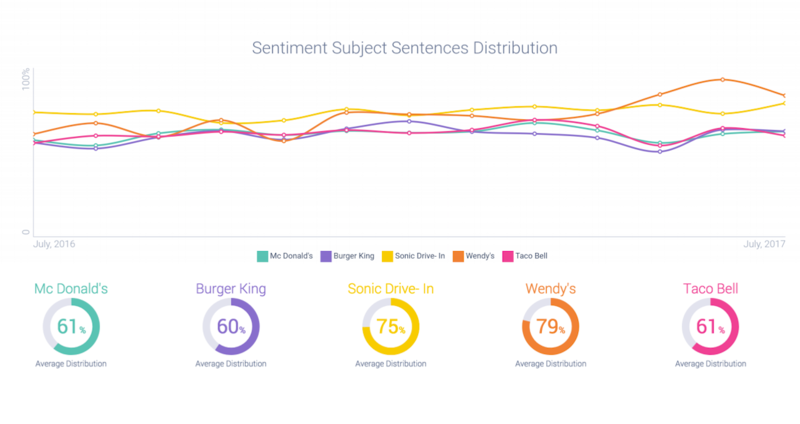 Today, brands like Sonic Drive-In are employing the use of social listening data to better understand audiences and build strategies that are driven by consumer research data, not just sales numbers and web page views. We can go further with data about our consumers, audience personas and demographic research by using the machine learning analysis of social listening. 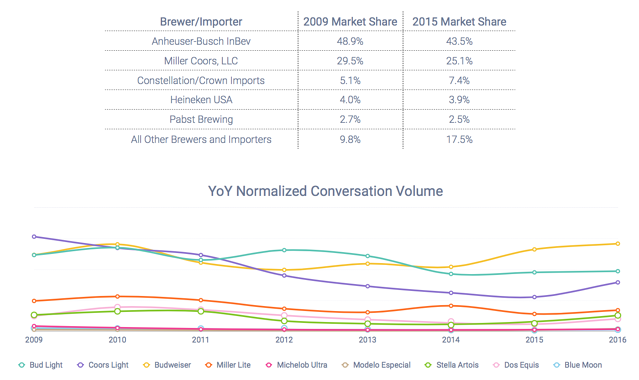 Strategists now have access to more information about their competitors than ever before. Thanks to the information social listening can discover about all sorts of people, places and entities, marketers can learn tons of information about other companies and their customers or fans. Competitive intelligence can help you identify what kinds of strategies your competitor is implementing, how successful their campaigns are, what people think about the competitor, its various initiatives, and get an overview of their demographics. A great example that our clients use often: comparing online audience sentiment of two competing brands during a specified period of time. 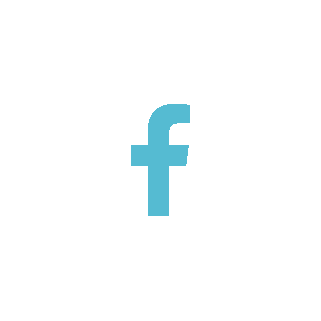 As a strategist, you can employ the many innovative ways to use social media data to your advantage and understand more about your competitors. A need-to-know insight for strategists is share of voice. 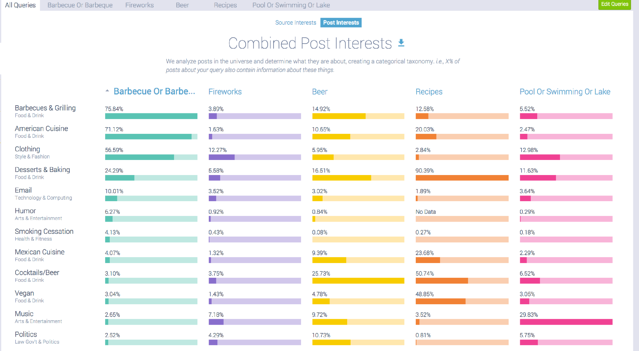 This is data about the salience of certain topic, conversation, brand, personality, influencer, and other entities. How much are people talking about a given subject? Social listening provides a great opportunity to measure just how much of a splash your brand, industry and products are making within the audience base you’re targeting. This can help you compare your brand to competitors and pinpoint areas of success and opportunity. By measuring the the share of voice around a specified topic, you can measure and understand what your brand’s standing is compared to others. What do people think of your brand? How well are you addressing their needs? Does your company provide the value they are seeking? Knowing the amount of people discussing you, then analyzing their sentiment, emotions, passion points and online behavior, you can effectively see a great snapshot overview of your place in the market. 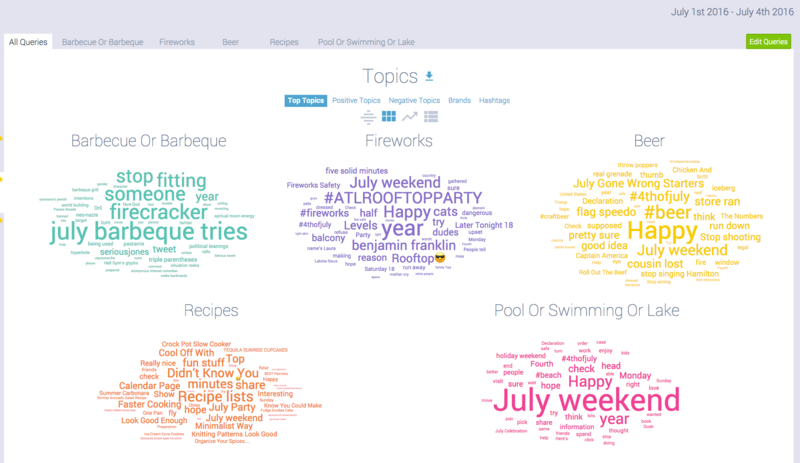 So we’ve covered cool measurements like sentiment analysis here. But what if you wanted to see sentiment over time, going back years? With a few clicks, listening gives you instant feedback from years ago, all the way back in the infant days of social media and the rise of online conversations. We’ve seen brands find some incredible insights about past campaigns, consumer trends and online conversations from utilizing social listening data. Strategists will be able to prove out their brand’s past marketing and advertising efforts, explain what’s worked and what hasn’t and use that for future campaigns. There is a host of new opportunities for marketing strategists thanks to the powerful research capabilities of social listening. As you’re working on your strategy and marketing tactics for your brand or business, rely on high quality information about consumers, brands and influencers to make that strategy go the extra mile. 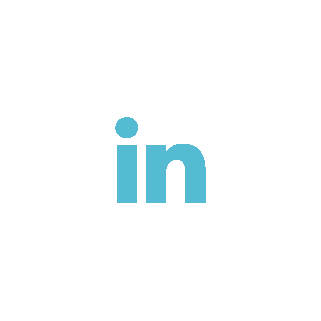 You can get a free, personalized demo here to see how social listening can help your marketing strategy.